All new posts will appear there, not here. A Toronto Sun story on a fatal shooting at Caribana has brought out the troglodytes among their readership. None of that elitist opinion you find in the consensus media here. “Remember what the WOPS did in the 50’s?.. the black crime will eventually be obsolete..
Today’s mining disaster in Ukraine had me wondering about how many Canadian miners die every year. 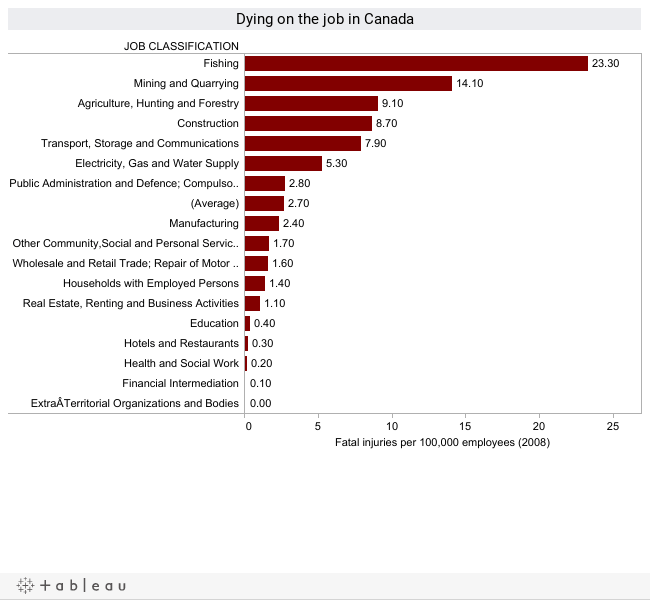 I had wrongly believed that mining would be the most-dangerous job in Canada. Substantially more fishers die on the job. Real estate agents do much better. Slap one on your car bumper, if you like. Put it on city police cars and ambulances, if you think it’s necessary. You can even drape a giant one in the arrivals area of your international airport. 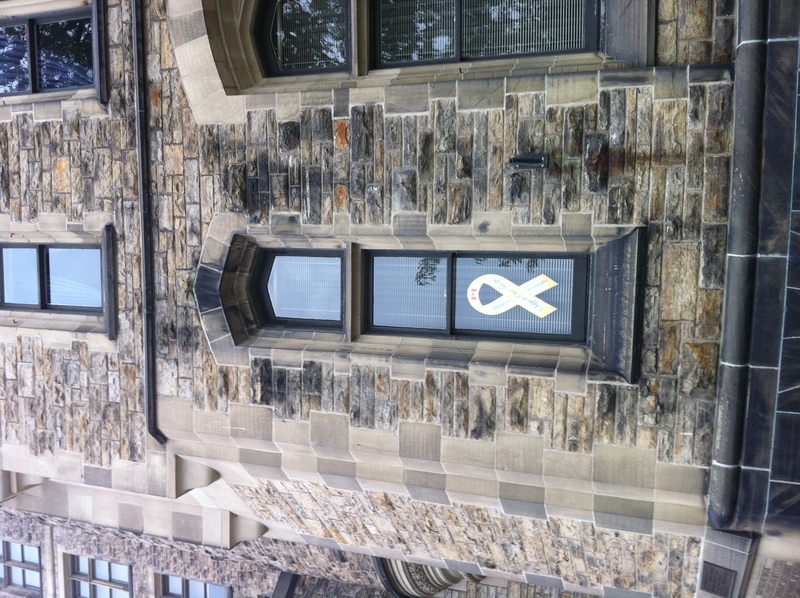 But, really, do we need to plaster oversized “Support Our Troops” decals on the Parliament Buildings, too? The decal on the left is an a window that appears to be the office of Ottawa-Orleans Conservative MP Royal Galipeau. The other one is in the window of another Galipeau office, or his neighbour, the Honourable Member for Las Vegas – the Islands, New Democrat Ruth Ellen Brousseau. I couldn’t tell because all the offices in that corridor were closed this morning. Now, Support Our Troops has become such a mantra in the current political climate that no one dares question the sentiment. But should the buildings that house our government be turned into billboard to trumpet a message, no matter how widely supported? 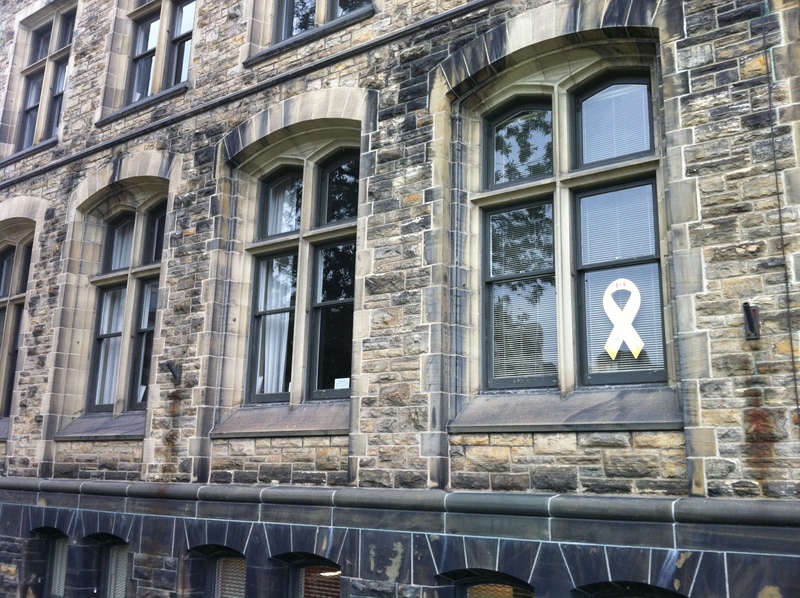 How would we feel about a giant AIDS ribbon hanging from a window? Or what if Conservative Rob Anders dangled his “Free Tibet” t-shirt from his office window, instead of wearing in front of Chinese officials?